The day that fans of the Marvel Universe have been waiting for is finally here! Black Panther is officially in theaters today, guys! I am totally going to see it when the theater clears out of all the people that cannot wait to see it this weekend. Trying to be patient until the end of February is going to be hard, but I’m gonna do it. I’m most excited to see Lupita Nyong’o as Nakia in the film. I found this really cool fan art of Nakia on Deviant Art while looking for something to feature on this week’s Fan Art Fridays. Created by Cara Stratton (Erynnia on Deviant Art), the fan art is inspired by this photo of Nakia and Shuri (played by Letitia Wright). I love how Lupita Nyongo’s cheekbones shine through. Contour. On. Fleek. 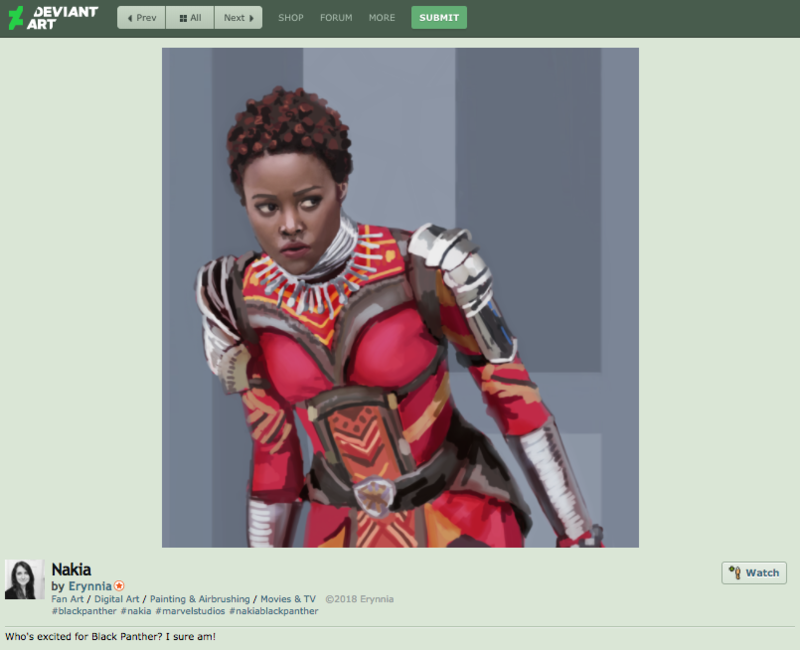 See the original fan art here, and watch the trailer for Black Panther below.